for your mom, grandma or sister for Valentine’s Day. It’s the perfect way to say “I love you” because it’s much more thoughtful than picking up the standard box of chocolates at the store. And no one said you can’t put some chocolates in that toiletry bag when you give it to them anyway. Once you’ve picked out the fabric you want (I would suggest reds, pinks or Valentine-themes prints) cut two pieces fabric for each print into 16 X 12 pieces. 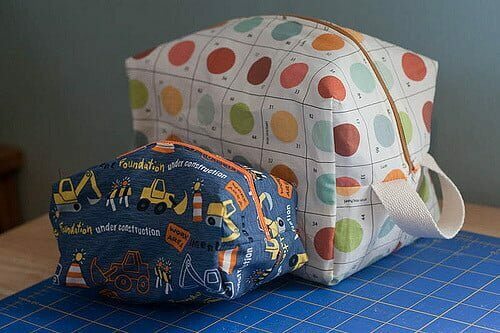 Take one piece of printed fabric that you want to be on the outside of your toiletry bag and put it print side down on your sewing table. Then take the 16” zipper so that the zipper is lined up with the top of the fabric. Then take a piece of inside lining fabric and also line this up at the top. Pin these pieces together and then use an appropriate color of thread to these pieces together where you lined them up at the top. Move the fabrics that you sewed to the zipper to the side so that you can sew on the other side of the zipper. The outside print should be right side up. To finish the other side, place you other lining piece print-side up, then the other side of the zipper and then the last piece of outside fabric print-side down. Pin these pieces together and then sew. Arrange the fabrics so that you have the wrong side of the zipper facing up and your lining fabrics hanging on either side. Open the zipper a little bit, pin the fabrics together and the edges and sew all four pieces together. using these directions, but with smaller pieces of fabric. Good luck and happy Valentine’s Day.